Hello again, my beautiful wildlings! Are you ready for your weekly intuition exercise? If you haven't already done so on the Facebook page, take a moment to ground yourself. Deep breaths. Relax. Now, look at the picture above. Which one of these cards speaks to you today? Don't overthink it. Just go with your "gut." Are you ready for the big reveal? Then, let's get to it! Feeling a little stressed right now? Are you having a "Calgon! Take-me-away" moment? The 7 of Cups is a card about choices. It often indicates confusion and can even also point to disorganization and too much going on. 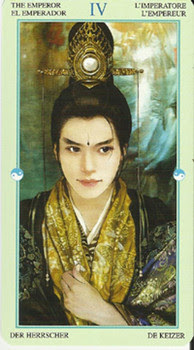 In general, this card points to a need to narrow your focus. When it appears, you are probably trying to do too much, and feeling like you aren't doing any of it well. Choose just a few of the myriad things that are on your plate, and work through these items one by one, carefully. You may be feeling overwhelmed. Remember that you can control at least in some areas, how much you are trying to take on. Visualize your most important goals and desires being met. Use affirmations and/or mapping exercises to help bring your goals to fruition. Keep an upbeat attitude. If you need help doing so, reach out for it. There are plenty of helpful influences available to you. Remember, these feelings of being overwhelmed can be summed up in, "this too, shall pass." 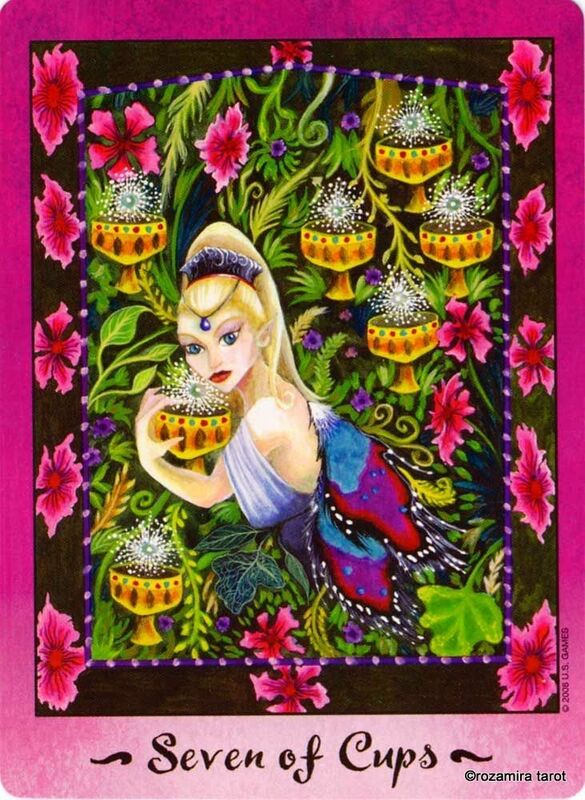 The 9 of Pentacles is one of the most uplifting and encouraging omens in the suit. This can mean that your financial worries are over for a while, and that things in general will be going better than you thought possible. Enjoy this good energy, and share your wealth and happiness with others. 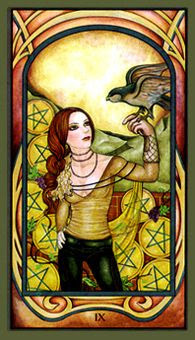 The 9 of Pentacles points to happiness and success. This is on both the mundane and the inner realms. You will have a great deal to be proud of and hopeful about. Expect the best to happen. You'll be in the position to help those less fortunate than yourself. Pay attention not only to your material abundance but also to your spirituality. Your self-esteem is possibly higher than it has ever been, which is a very good thing. You are in the position now to mentor others and to share the spiritual insights that you have accumulated. Spread the word, and share your happiness! The Knight of Cups like most if not all of the Cups suit, is an optimistic card to see in a reading. Knights are considered the messengers of the Tarot. This brings good news to you today. In general, the Knight of Cups tells you that things are going well. You are likely to be feeling charged up and ready for action. This card often means that good news (particularly in the realm of matters of the heart) is likely to be headed your way soon. 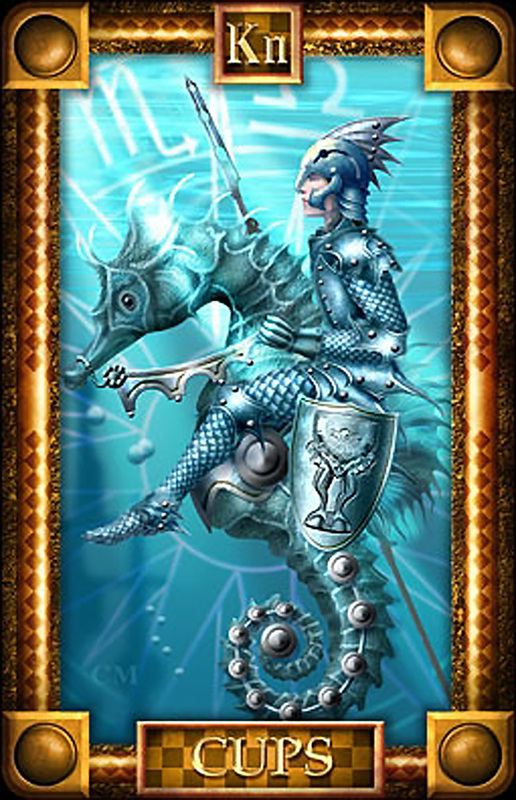 The Knight often means that you will soon receive a message from spirit (which could come from a living person) that will open up new ways of looking at things for you. Pay attention to things that seem like coincidence. These are often the way that spirit reaches us. When The Emperor is in the present position, you have the rule of law before you to guide you on your journey. 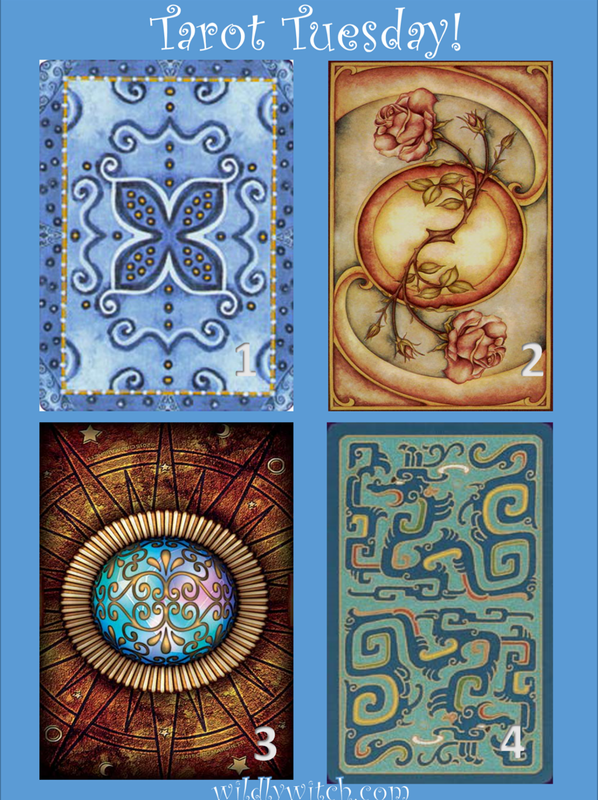 This card is especially strong in the present position as it gives you an absolute confidence to move toward a goal. This can also represent the influence of another person in your life right now. Are you so enamored of a new friend or lover that you have started following the advice and lifestyle habits of him or her? Have you discovered a new hero in the arts whose work has expanded your consciousness to the point that it is hard to relate to people who have not had a similar reaction to this person's artistic output? Is there a new teacher in your life who has changed the way you think? Perhaps a new person at work is transforming the way you approach your on-the-job goals. The theme running through all of these possibilities is that one way of seeing the world is coming to dominate the way you experience life. Be sure to take time out for yourself in order to honor your need for spiritual growth. Logic can lead you to the spirit, if you allow this, and if you don't get too stuck in your logical self. Meditation, (which requires great discipline) will come easier for you now if you make the time and effort. How did you do? Did your selection ring true for you? For those of you following each week, are you getting better at honing your intuition? Please leave a comment below, or on the Facebook page (don't forget to like and follow so you don't miss a Tarot Tuesday). I'd love to hear from you!